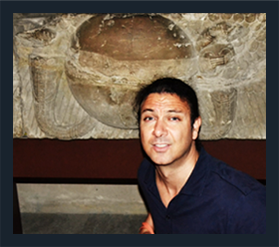 There´s a “missing piece” Egyptologists aren´t recognizing when it comes to the ancient Egyptian religion, and it played a central role in the artwork, culture and history of Egypt for thousands of years. 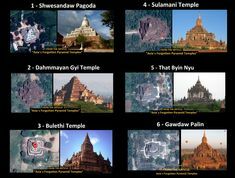 This missing piece is visible and present in the world´s oldest living religious tradition, the Hinduism of India, which was contemporary with ancient Egypt. 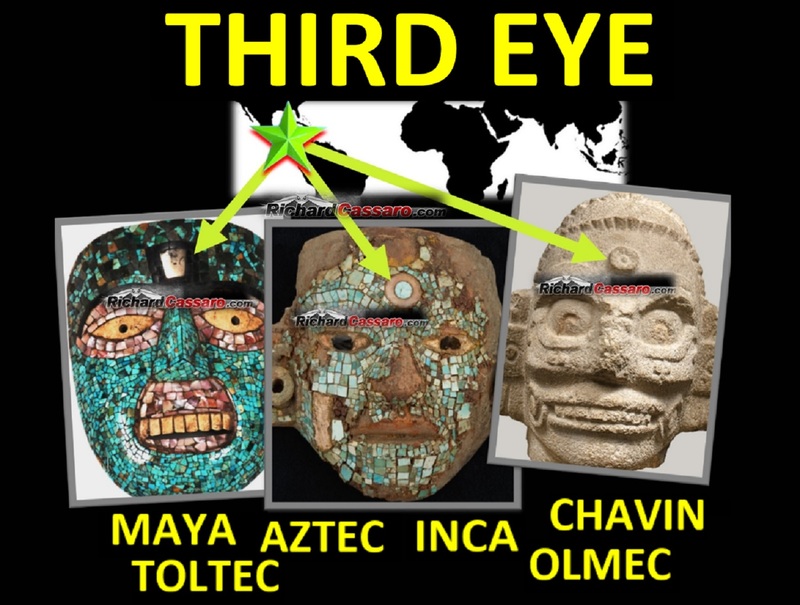 It´s called the “Third Eye,” and it´s been a main subject in my articles, lectures, and videos for more than fifteen years. 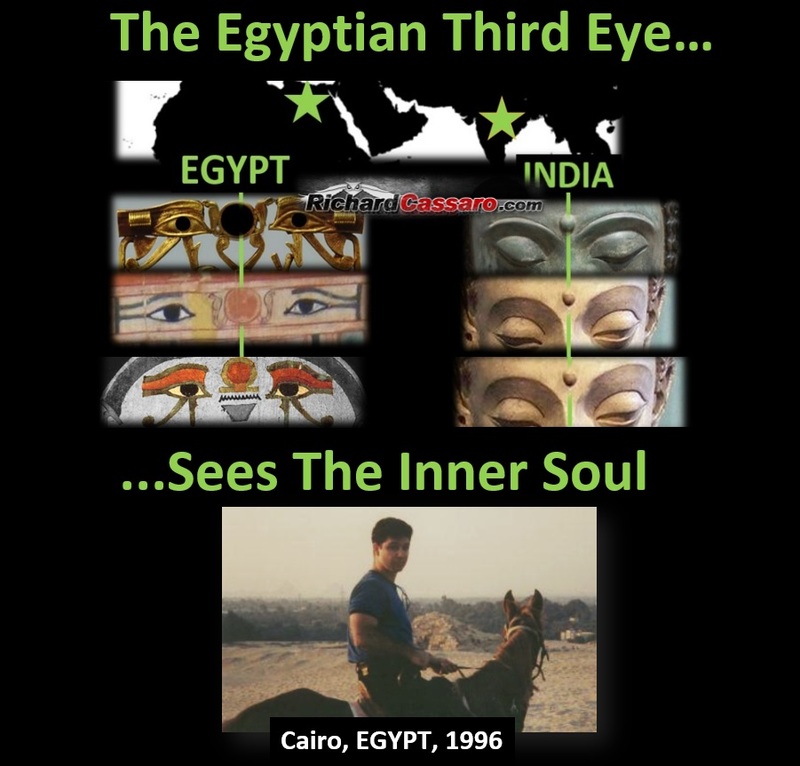 While living in Cairo, Egypt, in the Fall of 1996, I spent a great deal of time at the Cairo Museum, where I studied various aspects of the ancient Egyptian culture, including the little-known concept of the Egyptian “Third Eye”, one of many unsung Egypt/India parallels. I had just graduated from Pace University in New York City with degrees in Journalism and Philosophy, and I had saved enough money with my four-year college job working as the personal assistant to the President of Jägermeister to travel through Egypt, as well as other parts of the world. 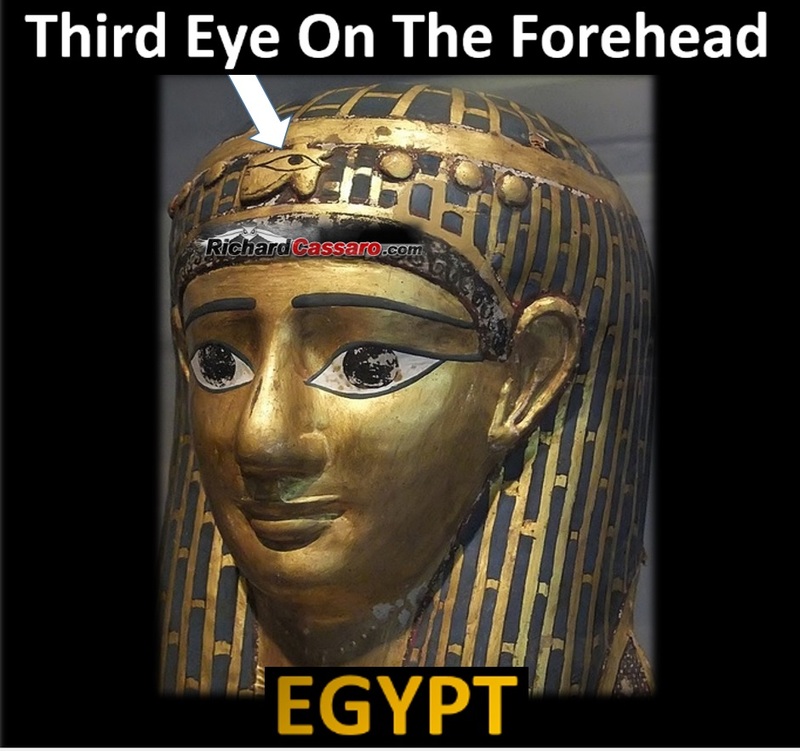 I had already read about the Third Eye in Egypt in books by H.P. Blavatsky, C.W. Leadbeater, Edgar Cayce, W.L. 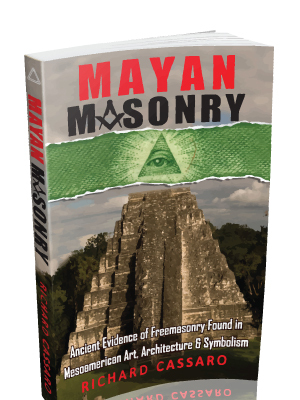 Wilmshurst, Alvin Boyd Kuhn, Manly Hall, John Anthony West, and Schwaller de Lubicz. 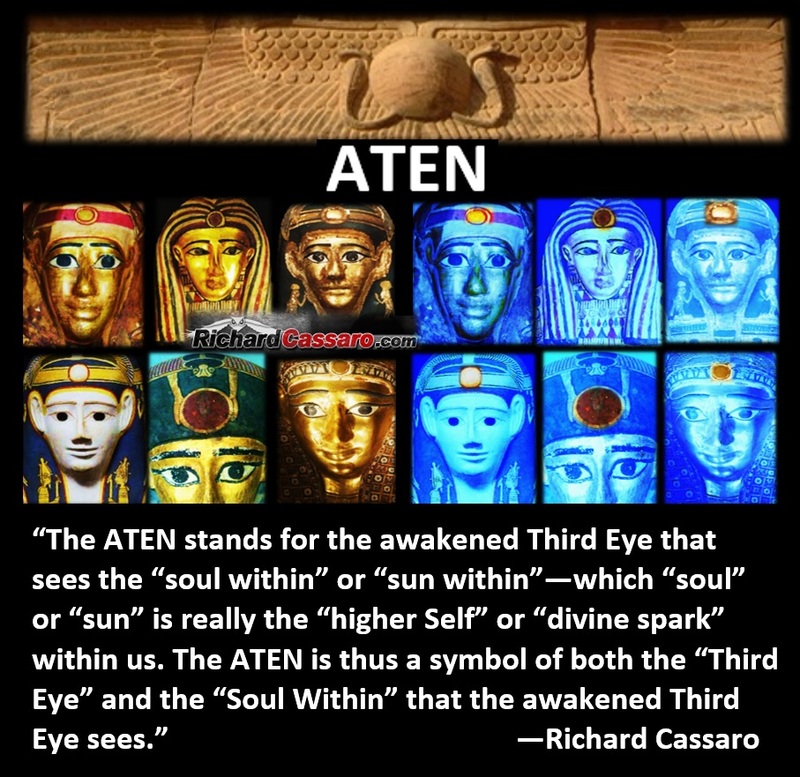 The “Aten” stands for the awakened Third Eye that sees the “soul within” or “sun within,” which “soul” or “sun” is really the “higher Self” – the “divine spark” within us. 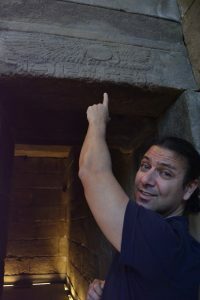 A lifelong passion for all things Egyptian, and a deep insight into the symbolism of the Egyptian religion, pushed me to make the journey to Cairo by myself at age 24, despite the warnings of friends and family after 18 Greek tourists were murdered earlier that year in front of their hotel, less than a mile from the Giza pyramids. Luckily for me, my first night in Cairo I met an amazing group of locals at a restaurant. They spoke English pretty well, and we hit it off. When they found out I was traveling alone and didn´t speak Arabic, one of them insisted I stay with him. I did—for the entire time I was in Egypt. My whole life until that point I was told by American news and newspapers that Arabs were hijackers, terrorists, murderers, jihadists, etc., and that they hate Americans. But now here I was in enemy territory, finding out that the enemy was in fact the American media, who seem to paint monsters out of entire nations of people when, in fact, just a few bad apples deserve blame. I would soon learn that the Egyptian gentlemen I stayed with was no ordinary person. His friends told me he was “one of the most famous singers in all of Egypt,” and I thought they were kidding—until the next day when we were mobbed on the street by hundreds of his adoring fans and had to make a quick getaway! A much younger me in front of one of the pyramids of Abusir outside Cairo, Egypt, 1996. Another highlight of my Egyptian adventure was that I began to see a repetition of a certain “three door” temple that I later began to call “Triptych Temples.” It was immediately apparent that Egypt´s Triptych Temples were special, and were in some way directly connected to the Aten symbol, but it was years away before I realized that Egypt´s Triptych Temples were centers of Third Eye awakenings. 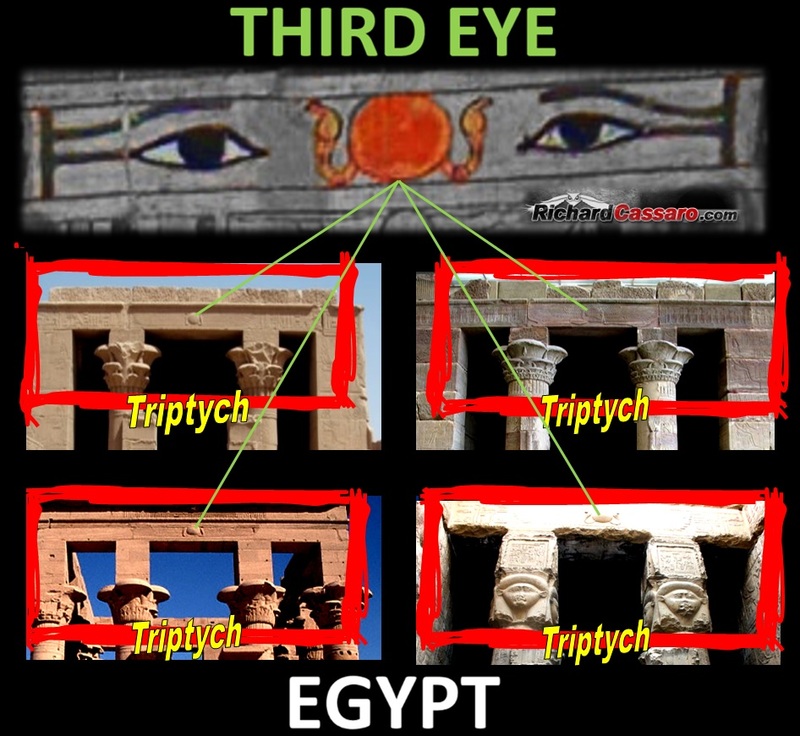 The “Third Eye” is a subject that caught my interest early in life. Its importance in virtually every occult genre led me to believe at a very young age that the Third Eye has deep roots in Antiquity. 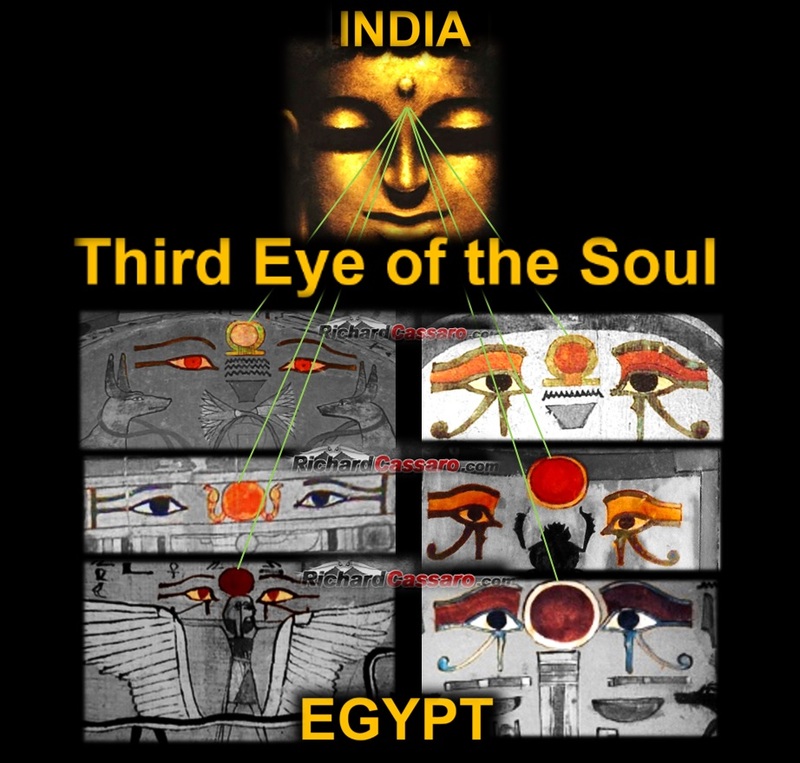 In other words, I felt that the Third Eye was inherited and preserved by the forces of the occult from Antiquity because there´s something about the Third Eye that is “intrinsic” to the human condition. 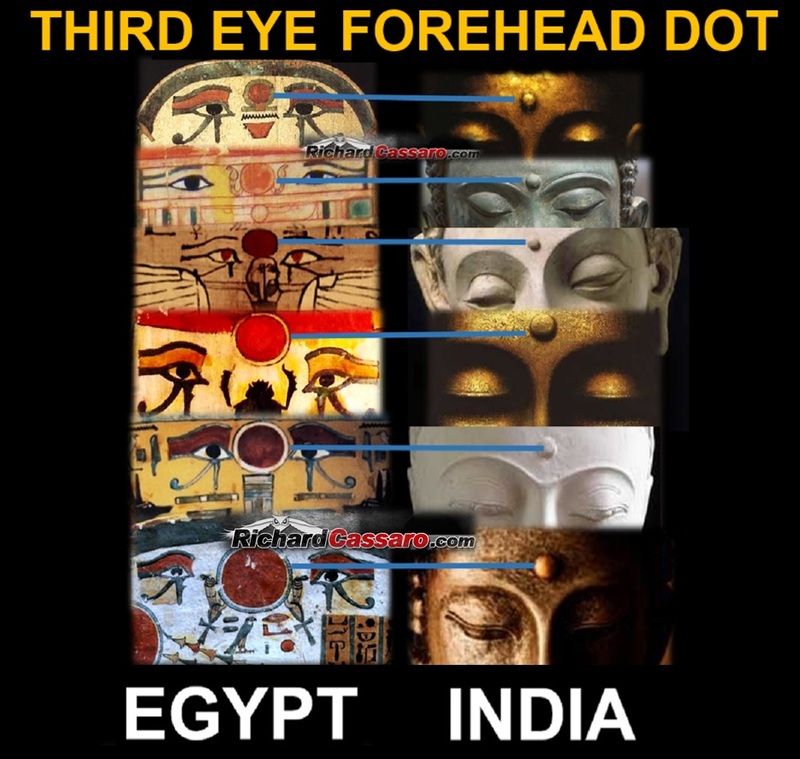 My studies of ancient cultures across the world have showed me that virtually all of them practiced the Third Eye; in other words, the Third Eye has “survived” in Hinduism, but it “existed” in virtually every ancient civilization in the world at one time. 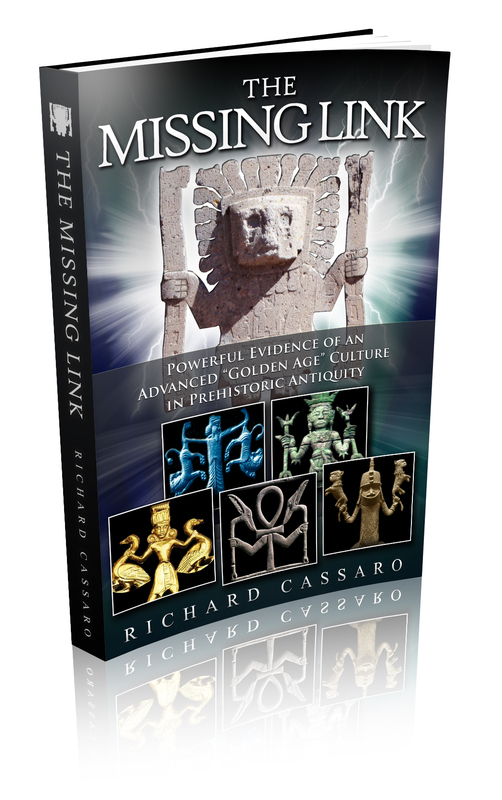 In my travels across the Americas (not long after my stay in Egypt) I noticed that a very ancient Third Eye religion lies embedded in the earliest layers of Mayan, Olmec, Toltec, and Pre-Inca cultures. 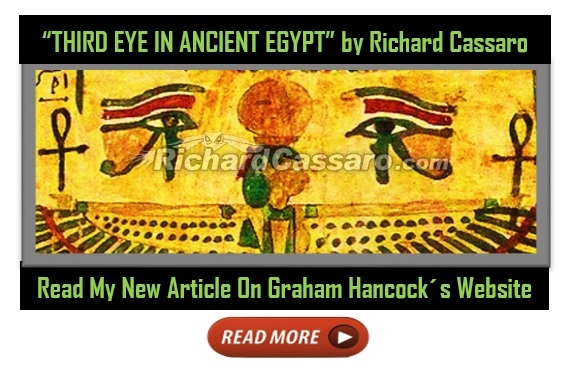 I´ve been posting ancient Third Eye images in the Americas and in Egypt and in other places around the world on my websites and providing esoteric information on ancient Egypt and the pre-Columbian civilizations of the Americas online and in books for more than 15 years. 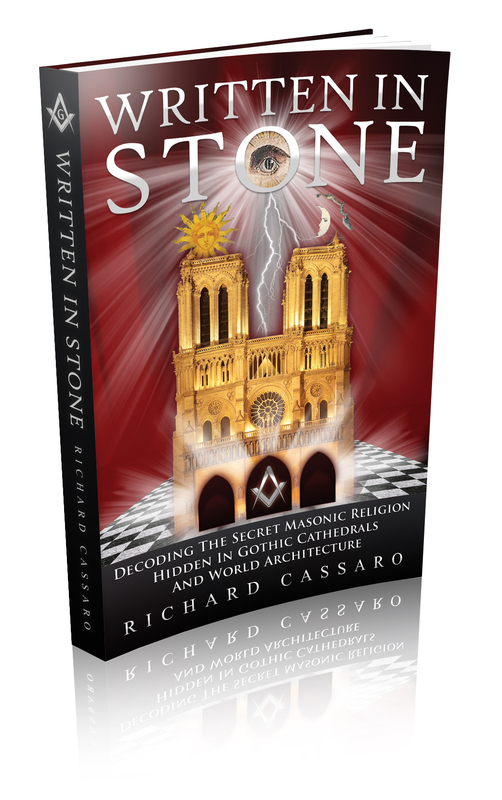 You can read a full summary of my research in Written In Stone (2011). What really drove home the importance of the Third Eye for me was the friendship I had struck up with two of my greatest teachers on esoteric wisdom—the Vice President of New York City’s Pace University and my Professor of Philosophy at Pace University, my alma mater. I became friends with them shortly after graduation because the two were not only good friends with each other, they were esoteric masters. One of the things they emphasized to me was that the Third Eye is of vast Antiquity. Most of the impetus for my research was initially guided by their enthusiasm and support. 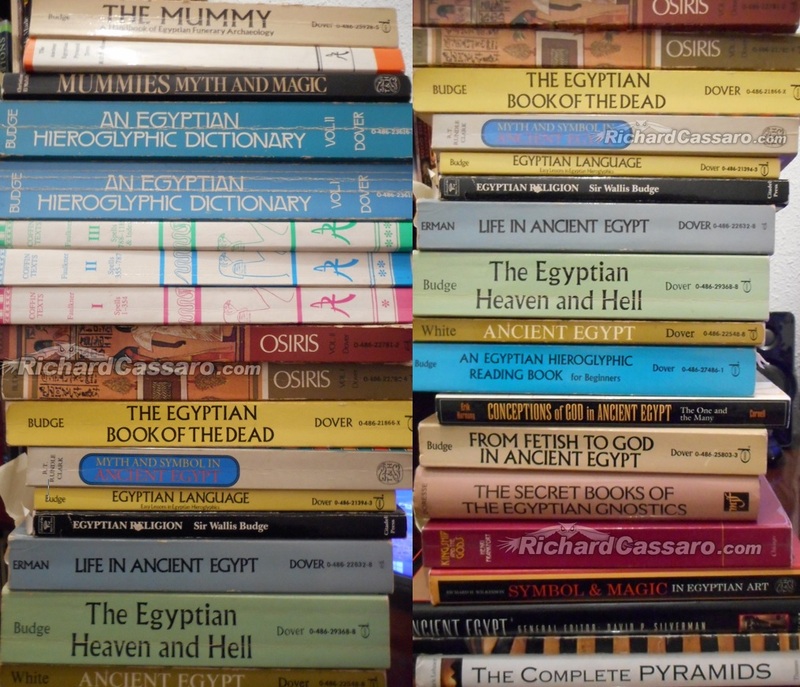 A few years later, while living in New York City and working as an editor in Manhattan, I sat in on Egyptology classes at one of New York City´s elite universities. The professor allowed me to do this when he found out about my trip to Egypt, my knowledge of Egyptology, my lack of financial ability or financial assistance to pay for a post-graduate education, and my strong understanding of the occult.